The Institute of Information Technology for Business (VCCI-ITB) and the VNPT Hanoi Business Centre recently signed a comprehensive cooperation agreement to promote joint ventures for business development and expansion. In addition, the two sides will focus on creating business support packages for applying high-tech solutions such as business digitisation, IoT services and e-commerce. Mr Le Van Loi, Director of VCCI-ITB, stressed the importance of cooperation fields in the future. 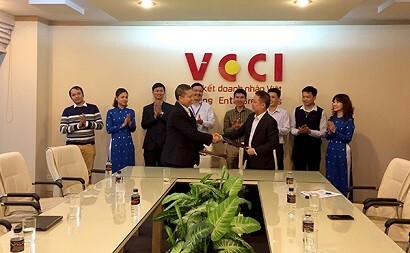 Specifically, on business digitisation, VCCI-ITB will collaborate with VNPT Hanoi in electronic invoices and digital signatures and offer comprehensive digital solutions to the business and integrates application programming interfaces (APIs) in accounting and financial management software (like ACSoft, VietSun and VietSunBA). Mr Le Van Loi said that VCCI-ITB and VNPT Hanoi will launch business support packages like electronic invoices, accounting software, Fibre-optic internet connectivity and websites. The two sides will provide support and discounts for businesses in the coming time, especially start-ups and VCCI members. On internet of things (IoTs) services, VNPT Hanoi is richly experienced in smart traffic cameras, environmental monitoring and automatic watering. Meanwhile, VCCI-ITB is the main coordinator of the IOCV community (IoT Open Community for Vietnam). The two sides will set up a specific programme to communicate and raise awareness and provide practical solutions in three main areas: smart cities, environmental monitoring and high-tech agriculture. The two parties are working on designing a communication programme to raise awareness of online business opportunities such as using e-commerce tools for online sales of locally advantageous products like handicrafts, garments, textiles, leather and footwear to North American and EU markets. Mr Tran Mai, Deputy Director of VNPT-Hanoi Business Centre, shared the view that digitisation will enable the two companies to deploy its services and solutions nationwide. The two sides signed an agreement on e-invoice service agency with a software accounting solution and sales software solution across the country.